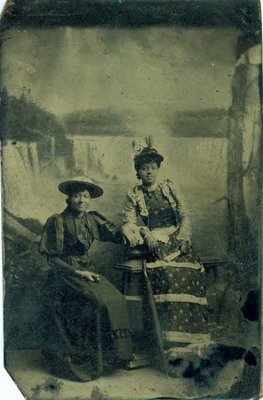 Two women sit in front of a painted backdrop of Niagara Falls in this undated black and white tintype photograph. The women and the photographer are unidentified. Both women are wearing hats and one woman has a parasol. This small tintype was in the possession of Iris Sloman Bell, of St. Catharines, Ontario. The Sloman Bell families are descended from former American slaves who later settled in Canada.